Where Should CEOs Invest Their Sales Training Dollars? A question that I often hear when speaking with CEOs is where should they invest in training? When I ask what they have done in the past, typically I hear a range of training activities primarily related to product training, service certifications, or other information related to what they sell. While obviously it is important for sales people to have a solid understanding of the products and services they offer, is this really the best use of your precious training dollars? In our experience, too often this training dives way deeper than it needs to as far as what a sales person actually needs to know to effectively sell. When companies put too much emphasis on product and service training, it tends to lead sales people to have conversations that focus on the features and benefits of the product, rather than the problems their product solves. If it were my money, I would rather invest in establishing good consultative selling skills. 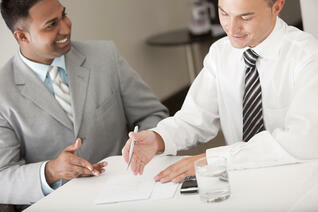 What are good consultative selling skills? To me, it's all about asking the right questions. Asking questions that engage the prospect about their current situation. Asking questions about issues and challenges the prospect is experiencing. Asking questions about the problems you solve, rather than how you solve them. From there really work on listening. Your sales people should be able to ask the right opening questions and then know what to listen for and what questions to use as follow-up. In our experience, salespeople who have had too much product training listen more narrowly (they wait for key trigger words that tie back to a product feature or benefit). It's really about having an intelligent conversation, asking good questions, listening carefully, asking more good questions, and repeating. Your salespeople need to keep repeating this process until they get to the real issues. They repeat until they uncover 6-8 compelling reasons to buy. They repeat until they get to a good understanding of the consequences of what the prospect is experiencing. Your salespeople should also be able to quantify the impact of these issues. Quantify both in terms of time and money. When you can get your sales team to take a consultative approach when they talk about the problem they solve, rather than the solution they have to sell, that's where you really get into effective, authentic, conversations. That’s what gets you to the real issues that will drive stronger results through your sales organization. In my opinion that’s where you should invest your training dollars. 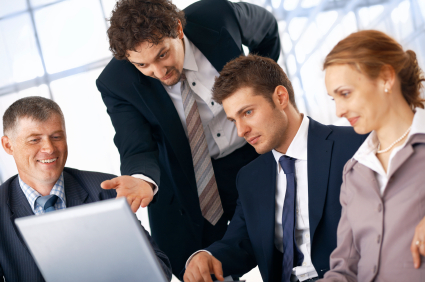 Which of my salespeople are trainable? Where do they need help? Will it be worth it? In other words, will I get a return on my training investment? For information on how to do a comprehensive Sales Effectiveness and Improvement Analysis to answer these and many more questions, contact me directly. Do this before you invest in training your salespeople – it will save you a lot of time and money. As a follow up to our recent post “Is Your Sales Forecast Giving You a False Sense of Security” I think it’s pretty safe to assume that your company has at least a few of the signs we listed that may indicate your CRM installation is failing (or is “sub-optimal” as CRM integrators like to say). Please don’t feel bad, many companies we work with struggle when it comes to getting their sales people and sales leaders to using the CRM properly and fully leveraging its power. This isn’t a new issue; however in this post we’d like to suggest a new approach that can help you do something about it. 1. You can continue the beatings until morale improves (“Ok team, get your CRM updates in by Friday or else!). I’m joking, but this is actually quite common. 2..Or you can try something different. An option we’re helping our clients focus on as they drive remarkable sales growth is to simplify things by using a goals-based coaching methodology. We’ve built an entire system around this and if you want the details you can send us anemail. For purposes of this post let’s keep it simple. Have everyone on your sales team identify a small number of goals to focus on for the upcoming quarter. These should be meaningful, achievable, easy-to-measure goals that align with their territory plan and their annual sales goals. How many goals? A good target in our opinion is three (3) business goals and one (1) personal goal. Sales Manager – making a key hire, increasing profit margin across the team, improving forecast accuracy, shortening the sales cycle, improving proposal win ratios, creating more consistent LinkedIn profiles across their team, etc. Personal Goals – these goals can be anything from fitness-related goals (losing weight, working out more consistently, eating better), to family-related goals (home by 6, family vacation, coaching your child’s team, etc. ), to personal development goals (reading three books, taking a class, learning a language, and so on). When sales people create a handful of meaningful goals (both business and personal) and begin to see the company as the means through which to achieve their goals, it is easier to motivate them and hold them accountable. And when a sales manager supports their team by understanding both the business and personal goals of every team member and discussing these goals during a formal weekly coaching session, it becomes easier to stay focused on the right activities and behaviors that drive success. And this focus and clarity will absolutely help you cut through the data fog we see too many failed CRM installations create. You might be surprised how powerful an impact this coaching methodology can have on your organization and sales growth. If you’d like some help getting started, please contact us. If your sales team has not been following a solid sales process all year, a “big push” at the end of the year probably won’t have much impact and could very well alienate a high number of potential prospects. Minimize the time and attention your sales team dedicates to dropping off gift baskets, bottles of wine, chocolates, nuts, and all the other gifts sales people like to dole out this time of year. Yes, customer appreciation is important and while these gifts can have an impact, your sales people will spend all of their time glad handing with customers if you let them. Have them do it, but with ruthless efficiency. Focus on the truly closable opportunities in your pipeline. That means opportunities where a strong case to make a change has been built, your sales people can articulate the impact using your product or service will have on the prospective customer (in terms of time, money, process improvement, strategic advantage, etc.) and can monetize that impact in clear terms, your sales people understand the budget, decision making process, decision criteria, timeline, competitive context, can meet all of the prospective customer’s requirements, and the prospective customer understands and has agreed to accept what your firm can’t do, and finally there’s a meeting scheduled for a final presentation, proposal review, etc. If your sales people cannot answer with an emphatic yes to all of these criteria, it’s not a closable opportunity and will likely not happen in December. Focus on booking appointments in January to get off to a strong start. Not just “how-you-doing” appointments or professional visits. Make sure your sales people are asking questions on their initial calls that identify a clear reason to meet. Think quality of appointments not quantity of appointments. Consider the 17 business days in December an opportunity to get a jump on 2015 rather than a frantic sprint to close a bunch of questionable opportunities that are not yet closable and you’ll be in a better position next quarter. So, that’s a good game plan for your sales team to focus on as 2014 comes to a close. What else? In our consulting practice we encourage our clients to use this time of year as an opportunity for reflection and thoughtful planning. Here are six (6) exercises you can have your sales managers facilitate in your next sales meeting or in their one-on-one coaching sessions to help take a look back before looking forward. All of the information should be available with minimal effort if you have a reasonably clean CRM system. If not, reviewing your billing reports should help as well. Top 5 Customers – Have each sales person identify their top five customers for the current year in their territory. Also have them identify the top five customers from the prior year. What changed? Who fell off the list and why? Who was added to the list and how did we win them? Are there any top five customers from the prior year that should be contacted? Can they book an appointment to see them in January? Top 5 Projects – Same thing as above, but instead of looking at total spend look at your biggest projects across all customers. In many cases there will be overlap between the first two lists, but probably not 100%. What were the situations for each of the top five projects? How do they compare to the top five projects from the prior year? Are there any learnings to apply to future prospecting efforts? Can you target specific situations that could be similar? Customer Sourcing – Have each sales person review their top X accounts (depending on your business, it could be their top 20, their top 50, or maybe their top 10). Where did they come from? How did they come into your world? Make sure your sales managers ask tough questions and really press for details. Typical sources will be client referrals, in-bound leads, trade show leads, prospecting, etc. What can you learn from this exercise? Are there any key referral sources or trade shows or other sources that should get more of your attention? What patterns can you discern across territories or product lines? Have your sales managers gather this data, discuss it with the sales team, and present it to the leadership team. Top Referral Sources – By sales person or territory, who are the top referral sources? What is the strategy for 2015 to keep them engaged and build a deeper relationship? Top Compelling Reasons – When looking at top customers or projects, have your sales managers facilitate a discussion with their sales team around why the customers chose to work with your company. What problems did they have that compelled them to go with you? What impact has your solution had on their business? Again, look for trends and patterns from this past year to see if your sales team should shift their focus slightly during sales calls next year. Lessons Learned – What experiments did your sales team run this year? Which of them worked better than expected? Which were colossal failures? What should you build on next year? What should you try next year? The goal of these exercises is to help make sure your sales leaders and their sale people are asking the right questions, learning something from the answers, and making the adjustments needed to drive incremental improvements year after year. As the year comes to a close and your sales team focuses on closing the closable opportunities and booking themselves solid in January, investing a little time for reflection and strategic thinking about what to do differently next year will pay big dividends. Need help? Contact us and we can help you walk through our territory planning worksheet. This worksheet serves as a guide to facilitate the type of discussion I outline above. What will happen to your revenue next year if your sales organization can find one or two nuggets to build on as they start the new year? What could happen to your revenue if you ignore these exercises and just keep repeating the same year, year after year? When you think about how little time it takes to travel the length of a football field while looking at your phone – and all the bad things that can happen while you’re distracted – it’s hardly surprising that so many accidents happen as a result of texting and driving. So what is the connection to sales coaching? In our sales consulting practice we recommend sales leaders establish a regular rhythm of coaching conversations with everyone on their team. Ideally these should happen weekly and biweekly at an absolute minimum. I can already hear sales managers groaning as they read that last sentence and thinking “when am I supposed to fit that into my already full schedule?” Well, think of scheduling regular, structured, formal weekly coaching sessions with everyone on the sales team as the same as looking forward and paying close attention while driving down the highway. Would you like your team to avoid big, spectacular sales crashes? Ask your sales leaders to look forward on a regular basis. Challenge them to ask questions on a regular basis. Ask them to observe (and share) patterns and trends in the market on a regular basis. Ask them to observe (and share) patterns, trends, bad habits, and self-limiting beliefs from your sales team on a regular basis. Challenge them to engage in role play on a regular basis (most sales managers will resist this at first because most are really bad at it). In short, make sure your sales leaders coach your sales people on a regular basis so they can stay ahead of all the subtle nuances and changes in your sales pipeline, allowing them to make minor smooth corrections rather than sudden shifts and dramatic changes. As CEO what can you do? How often are you coaching your sales leaders? When you talk with them, are you simply going through a tactical review of the pipeline? Are you asking the right questions? Are you leveraging the market feedback your sales team can provide in real time? 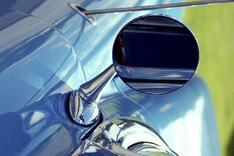 Do you see patterns in where your sales leaders are focused? Are they focused on the right things? The right activities? The right people on their team? What would happen to your sales culture if you lead by example and coached your sales leaders as you expect them to coach your sales people? Not sure where to start? We can help. We start by helping you understand the relative strengths and weaknesses of your sales leaders. How do they measure up in terms of their coaching skill set? How about the skills required to create a culture of accountability? Motivating the team? Attracting and retaining A-player sales talent (A-players won’t work for B-managers)? Growing the team? How about your sales people? Are they capable of growth? How much? Where do they need help? What self-limiting beliefs get in their way? Are they coachable? If you invested in their professional development would it be worth it? 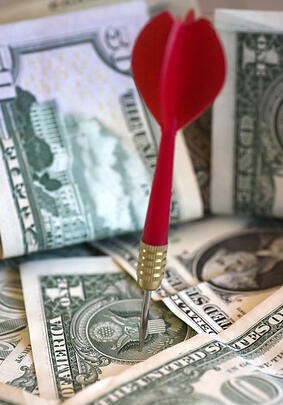 How long would it take you to realize a return on your training investment? 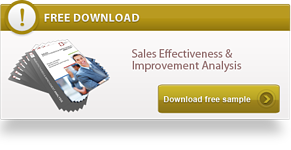 We can help you understand these and many other important questions with our Sales Effectiveness & Improvement Analysis. We’ll be glad to send you a sample and discuss whether or not this would be a good next step for growing your revenue. Or you could just keep your eyes down and hope you don’t crash. It’s up to you. For more information on how we can help Optimize Your Sales Team - click Here. If you’re on a calendar year, your VP of Sales is probably preparing their budget for next year. How much will they put in for sales training? How much should they? What kind of training should you invest in? Is there anything you can do to make sure you maximize the impact of your training investment? 1. 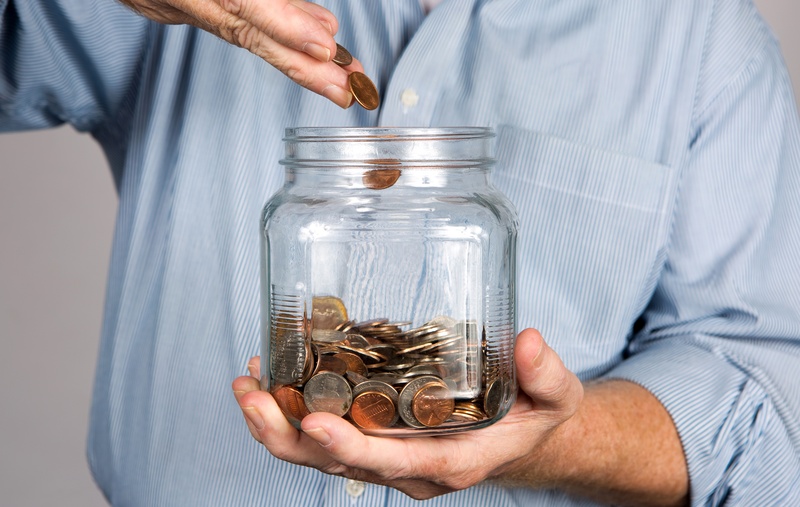 How much should we budget for sales training? A good rule of thumb for a high-performing sales organization is to invest somewhere between 3-6% of your sales payroll on additional sales training and development. So for a 10-person sales team where each sales person is making $100k, that would be $3,000-$6,000 per person, or $30-$60k for the department. If your sales team is already operating at a high level, you may be able to scale that back. If you have neglected investing in sales training and development, you may need to increase this budget until your sales team consistently performs at a high level. 2. What kind of training should we invest in? When you stop and actually look at how companies spend their training dollars (as we do in our sales force development consulting practice) a few trends emerge immediately. It seems most companies still use a “Feature/Benefit” sales model because what is often categorized as sales training is really just product training (if we drill in all those features, something will stick). Very little if any money is invested on developing sales people and giving them the skills to ask better questions and have intelligent conversations. Even less attention is given to sales managers who need to develop the tools and skills they need to become better coaches. There is often a bias toward “quick fix” seminars and one-day training sessions. High-impact one-day training doesn’t work! It's like trying to take a sip of water from a fire hose, most of it runs off and dries up in a short time – and you get water up your nose! The most effective training programs are delivered in a “blended learning” environment that combines live workshops that emphasize role play along with individual study that allows each sales person to focus on their particular weaknesses. No matter how the training is delivered, reinforcement and follow up coaching by the sales manager is critical. This type of reinforcement training provides opportunity for clarity and real world application. And that is when true change happens. 3. Is there anything we can do to make sure we maximize the impact of our training investment? Who on the team is trainable? Do we have the right people in the right roles? How much training will they need and is it worth it? What impact will training have on improving my sales pipeline? How about our closing percentages? What about increasing margins? What type of return-on-training-investment should I expect for my current sales team? Are my sales managers doing everything they can to grow the business? What should my sales managers start doing? What should they stop doing? Who on my sales team can we save and will it be worth it? Investing in a sales training program without being able to answer these questions would be like publishing your financials without getting an outside audit. Ask these questions when your Sales VP turns in their first draft budget you’ll have a very productive conversation. Making the decision to hire a new sales person can be the hardest part of the process. Once you get over the hump and make the decision – you have months of work ahead of you. Even with the planning and preparation, many companies that hire sales people in the upcoming months will make costly mistakes and will ultimately fail to improve the strength of their sales organization. What can you do to avoid their fate? Here are five simple steps to put you on the path to implementing a "Superstars Only" policy. 1) Identify what the "ideal candidate" must have in terms of experience and attributes. Many hiring managers really do not think in terms of what a sales person must have done successfully in the past to be successful at their company. Think about why sales people have failed at your company. What was it they could not do effectively? Whatever it was, make sure you clearly identify what your new sales candidates need to be able to do to thrive and succeed in your sales environment. Using the right assessment gives hiring managers a tremendous advantage because it allows them to take an objective, third-party look at every candidate before they become emotionally involved or make subjective judgments based on the interview. In addition to helping you comply with Equal Employment Opportunity Commission (EEOC) guidelines, the right assessment will help confirm or challenge your impression of a potential sales candidate. It will also help guide the interview process by highlighting potential weaknesses to explore and address. While many hiring managers think the interview is the most important step in the hiring process, its usefulness is somewhat limited. That said, it's still the best way for you to gauge a candidate's ability to think on their feet, overcome resistance and build rapport - important skills for a strong sales person. Keep your interviews short and use them as a test drive to help you imagine how the candidate would do with your most demanding prospect or customer. Do not waste valuable interview time asking questions that were answered on the resume or application. 4) Make good use of the resume. Most sales managers will eliminate potentially strong candidates who do not have the right industry experience and educational background. However, it's a lot easier to hire a strong sales person and teach them your domain than to take a domain expert and try to teach them how to sell. In a few highly technical fields I might give domain expertise more weight, but in general it's easier to hire strong sales people. The most important information on the resume is rarely used. For example, look at the average tenure at their previous jobs. Do they switch every two years? If you have a longer sales cycle and it will take some time to ramp up, be careful about hiring someone who may not stay with you long enough to get a return on your hiring investment. Also, the time of year they switch can help you understand when they struggle or when they may hit a slump - valuable information for a sales manager. 5) Understand the cost of your past hiring mistakes. Nothing will help you focus on "doing it right" like going through an exercise to document the impact of your past mistakes. You can use our free calculator right here to get started. Every hiring mistake at your company is costly, but when you hire the wrong sales person the impact can be even greater since they're out in the market representing your company and brand. Companies spend billions of dollars every year on training initiatives. How would your hiring process change if you viewed "development" as starting with each hiring decision? How much higher would the return on your training investment be if you considered whether or not a potential sales candidate is "trainable" and what their "growth potential" might be if they received appropriate training? How much faster could they ramp up if you had a sales development curriculum specifically designed to address the weaknesses uncovered in your hiring system? If you are not already asking these questions, you need to start. Right Revenue vs. Wrong Revenue - Do Your Sales People Know The Difference? We’ve seen many situations where sales people (and sales managers) are so focused on booking new business -- any new business -- that they never stop to consider whether or not the revenue they are pursing is “good revenue” for the business. In many cases, this challenge is compounded by poorly designed compensation plans. In order to improve your sales team's ability to drive good growth, they need a better understanding of what that means for your business. They need to know who to target for optimal profitability, the types of challenges your prospective customers face that you can solve exceptionally well, and when they should walk away from a potential opportunity because it won’t hit your target profit levels. Part of this comes down to understanding exactly who your sales team should target (and whom to avoid). If you’re not sure where to start, I recommend reading Bob Bloom's book Inside Advantage. It will help you understand your “who” so your sales team can start building a base of ideal clients. And when you have a strong base of ideal clients – people you can serve exceptionally well and who are willing to buy your product or service at optimal profit – you should see your NPS improve as well. And of course when your NPS improves and your strong base of ideal clients begins telling their friends and colleagues about how great you are, the number of referrals and introductions your sales team receives should go up dramatically. This creates a virtuous cycle of stronger and stronger revenue growth, rather than the vicious cycle we see when sales teams target whatever revenue they can get. 1. Does everyone in your sales organization – especially sales leaders – understand who your most profitable clients are (top 20%), what makes them profitable, and what problems they have that your firm solves exceptionally well so they can identify similar situations and sell with great stories and examples? 2. Does your compensation plan consider gross profit margin? If not, do you have strong controls in place to make sure your sales people are focused on opportunities that will hit your margin objectives? 3. Is everyone on your sales team capable of serving/selling your ideal target accounts? If not, where do they need to improve? Is it a skill gap issue? Is it a Sales DNA issue? Will they improve with coaching and development? 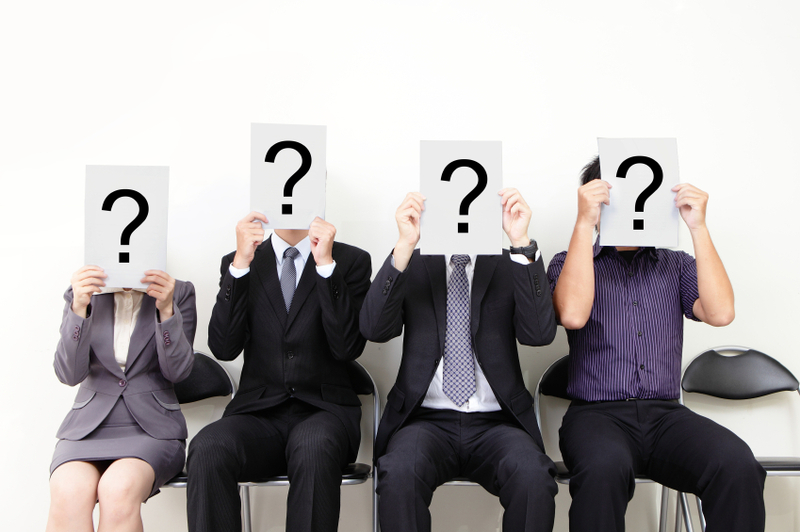 Do you need to reconsider your approach to recruiting and developing sales people? 4. Are there operational bottlenecks created by sales people booking “bad revenue” just to make a sale? How do your managers in operations communicate that to your sales organization? How aligned are your operational managers and your sales managers? How often do they meet to share feedback and brainstorm ideas to get better? 5. As a leader are you part of the problem? Are you ignoring the impact bad revenue is having on your business? What would happen if you focused your time and energy on making sure every new piece of business aligns with your ideal client targets? When can you get started? I love this cartoon because it is so true. The more you listen the more you sell. 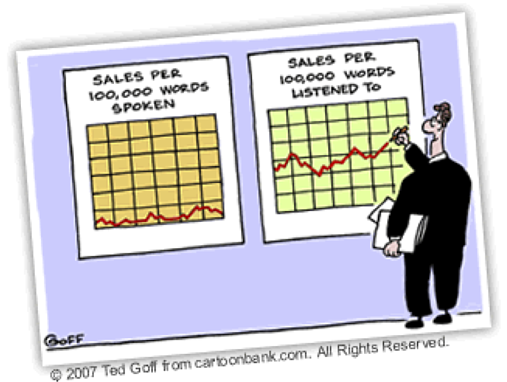 How effective are your sales people at listening? At truly listening…not just to what is said, but what is not said. Not just for the words used, but also the intent behind those words. If there is one thing you can get your sales people to do more effectively this year that will dramatically improve sales, drive revenue growth, get into new accounts, expand existing accounts, increase profit margins, and improve customer satisfaction -- I can make a strong case for improving listening skills. When sales people really know their stuff, they have no problem listening effectively and asking open questions. When they are unsure of themselves and lack confidence, they tend to talk about what they know rather than ask about something they might not know. Instead of slowing down and investing quality time in quality prospects, many sales people buzz from call to unqualified call. They sure look busy! But being busy is not the same as being productive. For too many sales people, it’s all about them. No, it’s all about the customer and prospective customers. It is impossible to listen effectively if your sales people feel it’s all about them. Yes, your sales people can get better at listening. Just like they can get better at asking questions or making prospecting calls. Listening is a learned skill and like every skill worth having, it takes practice and consistent maintenance to stay sharp. If your sales people sound like they are reading from a script, they are probably waiting for the prospect to finish talking so they can get to the next question on their list. Great listeners stay in the moment, giving all of their attention to the person speaking and responding with great follow up questions because they are fully engaged. Great listeners can absorb everything being said, pull it all together succinctly, and summarize the key points back to the prospect. As a sales person improves their ability to quickly synthesize what is being said and provide a concise summary that is accurate and on point, they will learn what to listen for and how to listen better. When they can make connections that the prospect has not considered, they will do even better in terms of moving the conversation forward and being memorable. Some sales people just like to hear themselves talk. It may be because they lack confidence (see #1 above), but it can also just be that they like to talk. We have two ears and one mouth for a reason – we should listen twice as much as we talk. So in a one-hour sales meeting your sales people should talk for about 19 minutes and listen for about 41 minutes. How full are your sales people’s calendars? Listening takes practice and if your sales people are not regularly engaging in qualified sales meetings to keep their listening skills sharp, they fall apart when they finally do get in front of a prospective buyer (or worse, they think they do great but when your sales manager debriefs them it becomes clear that they didn’t truly listen). While it is helpful for your sales people to know what they should be listening for, they also need to be flexible enough so they can catch all the information being shared. Sometimes sales people are simply so focused on listening for the one or two specific issues they know they can solve, they miss great information that could also move the conversation forward. Listening is a skill that needs constant reinforcement and development. Are your sales managers doing everything they can to coach and reinforce effective listening skills across your sales team? Do your sales leaders know how to coach for improved listening skills? What would happen to your revenue and profit margins if they did? If some of these issues ring true for you, tell us the top three listening challenges your sales team experiences. I also recommend reading Just Listen: Discover the Secret to Getting Through to Absolutely Anyone by Mark Goulston. And never underestimate the power of a good listener. It’s the time of year when we take stock of where we are, and make plans for where we want to go. What went well in your business in 2013? What didn’t go so well (or “needs improvement” as some people like to say)? As you create a sales plan for 2014, and map out where you would like your business to go, consider some specific things you can do to improve sales productivity. Here are five (5) objectives we suggest you consider. Whether you select one of these or come up with a sales improvement plan of your own, pick at least one area to focus on in 2014 and stick with it for the next four quarters. In Good to Great and the many subsequent books resulting from his research on what makes companies great, Jim Collins notes that the first step to being a great company is to face the brutal truth. about making significant progress this year in terms of growing revenue, improving margins, building a predictable sales process, shortening your sales cycle, closing more business, and developing your people, investing in a detailed analysis of your people, systems, and strategies should be your first step (link to sample SEIA report landing page). Your sales pipeline is the single most accurate forecast of incoming revenue in your company. Your management team should review it regularly and make adjustments accordingly. Your operations manager must use your sales pipeline as a guide to adjusting capacity requirements. Your Chief Financial Officer should use your sales pipeline as a guide for making strategic investments and managing cash flow more effectively. In fact, everyone on your management team should look at your sales pipeline and gain confidence. Most companies don’t use their sales pipeline this way because it is usually a joke your sales manager tries to defend and justify at management meetings. What would happen if you had a reliable sales pipeline your leaders could count on? Your sales managers should spend about 50% of their time directly coaching your sales people. It is the only way your sales people will make consistent improvements so that every week, every month, and every quarter you will be able to look at the behaviors and activities across your sales organization and say “Yes, we’re clearly getting better. We’re having better conversations. We’re getting into better opportunities. We are winning business more consistently because our proposals are better qualified. We are selling better work at higher margins. We are improving customer satisfaction. We have better communications from our sales team to the rest of the organization.” To be able to say these things you need to commit to a consistent and rigorous coaching routine. Upgrading your sales talent can be a growth strategy. 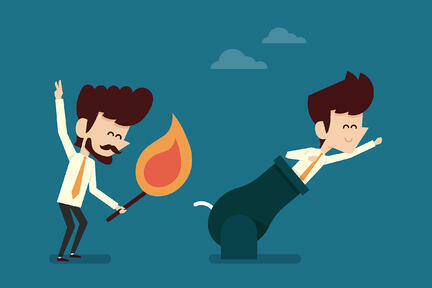 How many people on your sales team would you enthusiastically rehire? Who are the mediocre performers on your team that you tolerate because you don’t want to make a change? What is your plan for these B and C-players? Can you develop them? Coach them? Put them in a position better suited for their skills? What would happen if you committed to an A-Player-only hiring strategy? Perhaps this is the year to make that happen. Sometimes we just take the work our sales people can sell instead of being focused and disciplined around selling to accounts that best fit our model. Who are your best accounts? The idea of “best” could mean most profitable, easiest to work with, most strategic potential, deepest relationship, or many other factors. What would happen to your business if your entire account base was comprised of customers who really fit what you do? Who are the customers that take up disproportionate resources? Can you adjust your pricing to encourage them to leave (freeing up valuable resources for customers who are a better fit)? Looking at your sales pipeline, are your sales people targeting the right types of accounts and are they having conversations at the right level? Or are they just taking whatever they can get? What would your company look like 12 months from now if you narrowed your market focus and aligned your sales organization around the accounts that best fit your operation? Make it a priority to clearly define what your ideal account looks like, and include it in your entire sales process. Where does your sales team “need improvement” this year? Let us know which one you picked and we’ll check in with you in 90 days to make sure you are sticking with it! There are only a few seats remaining for our upcoming free seminar, "The Ultimate Sales Call, Five Lessons that Drive Results" on Wednesday, June 20, 2012 at the Milwaukee Athletic Club. After the seminar there will be a free Networking Event on the rooftop where you kick off your summer in style with your peers. It’s Not About You – when talking with a client or prospective client, the more you can make it about them – their problems and challenges, their operational issues, their missed opportunities, their cash flow struggles, their people issues, their production challenges – the better your conversation will be. Narrow Your Focus – to build up your pipeline get very clear about who your target accounts should be. What type of companies do you like working with? What challenges do you love to help solve? What style or personality type do you enjoy working with? Think carefully about who your ideal clients would be and then build your list. We will review some simple tools that can help you build highly focused, targeted lists. Mind the Gap – when talking with a prospective client, your goal should be to ask lots of questions to help the prospect understand the gap between where they are now (without your help) and where they could be if they were to work with someone like you. The more time you can spend drawing this comparison and increasing the prospective client’s awareness of this gap, the better your results will be. To find out how this worked for Martin Luther King and Steve Jobs – please see this post from my CEO Sales Guide. Questions are the Answer – one of the bad sales habits we see right away in our role play exercises is the tendency for sales people to make statements that could easily be turned into a question. When you make a statement to a prospect, they can disagree and argue with you. If you turn your statement into a question and have them say it, it’s true to them and it is much more difficult for them to argue or disagree. Purpose and Next Step – begin every sales meeting with a clear purpose (e.g. “here’s what we’d like to do today…”) and end every meeting with a clear next step that the prospect agrees to do (e.g. “We’ll talk next Tuesday to schedule a meeting with your management team….”). How often do you sit down with the "perfect prospect," have a "great conversation," only to find yourself in chase mode as you try to move forward and suddenly they disappear? Starting every conversation with a clear purpose and ending every conversation with a clear next step removes this ambiguity and keeps your sales process on track.